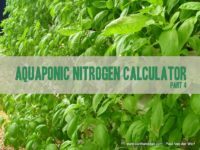 In this first aquaponic nitrogen calculator we are going to work from the fish to the plants. Later we will reverse that process and publish the calculator. The input in your system is primarily the fish food. As mentioned earlier, the nitrogen content in the fish feed is very expensive compared to other sources. The biggest risk or loss of nitrogen is through denitrification where the nitrogen is released as gas into the atmosphere. It does not come back from there. We discuss this in more detail in the next part of this series. For example: A bag of Calcium Nitrate will contain on average 155 grams of nitrogen per kg at a cost of around $0.80/kg. Your fish feed will contain on average 51 grams of nitrogen per kg at a cost of $1.50/kg. So you can see adding fish feed to fertilize plants is very expensive so it is important to get the most out of it. The above table will be familiar to those that have gone through the first 10 parts of our Tilapia farm design series. You will see some of the basic numbers derived from the same or similar formula. There is a slight difference in the daily feed rate because we are summarizing the overall production not specifically laying each stage out. However if we look back on our previous plants to feed to fish article you will notice a similar feed rate average. For those that have not gone through each of the parts here, we will quickly go through them again to help with understanding the inputs to the calculator. Production This is the total fish production in a year. So if you are planning to grow 20,000 kg per year (yes I know we will have to do an imperial one as well), this is the number you enter into this cell. There is no limitation to the calculator aside from what numbers will fit in a given cell from a display point of view. So if you want to see how much plant space you supported by 1,000,000 kg of fish per year put that in! Assumed Feed Conversion Rate The FCR refers to the amount of fish feed it takes to grow 1kg of fish. For example if the feed conversion rate is 1.8 (which is quite high), then you will feed 1.8kg of feed to gain that 1kg of fish growth. In general terms we are aiming for an FCR of 1.2 over the period of growth however this rarely happens. This is used later in the calculator to indicate the amount of growth you will have for the period of feeding. To determine the FCR you divide the amount of feed given over the period of growth by the weight gain of the fish at harvest. Not many will have this in their active systems, but there is plenty of commercial data to give you a species indication. We have talked extensively about how the FCR can impact on the overall system loading and outcomes. When calculating how much plant growth you can have for the amount of feed, FCR again plays a pivotal role. We know that we can easily overload a fish system if we underestimate the feed input, much the same thing happens when we do the same for the plants. When we underestimate the FCR, which determines the biomass and amount of feed per day in our fish system, we may overload the plants with macro nutrients which will limit their growth. As you can see in the above example we have changed the FCR to 1.2. While that may be an ideal number to chase, if you end up with a FCR of 1.8, we will be feeding around 33kg per day more than the plants require and loading with that additional feed an increase of 1.7kg of nitrogen per day. So you can see how quickly things can get out of hand. 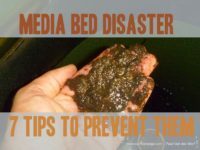 Having too much is not such a bad thing because you will increase your water exchange out of the system to adjust the nutrient profile and possibly some form of denitrification. To do that, is not inline with the purpose of integrated systems “more crop from every drop”… Feed Rate The feed rate of any given system is determined the fish species, its age or weight assuming you are running at the optimum growing temperature for the species. The feed rate is the amount of feed the fish will each in a day compared to their body weight or percentage of body weight per day %bw/day. Fish feeding is worked out like this so feed input is relative to their size and increase in growth. Young fish can eat up to 14% of their body weight per day, however as the fish get older that percentage drops closer to 1%. Generally, for most species over the period of growth their feed rate averages out to close to 1.2%bw/day. You are looking to enter the overall average feed rate. Protein The protein input is the percentage of protein in the fish feed you are using. This is the primary source of Nitrogen input to the system. The higher the protein the great the amount of nitrogen will be put into the system. Young fish will generally require a higher percentage of protein in the feed and as they grow the protein level is reduced to the level required by the species for healthy growth and energy. Your input will be the protein level used for the bulk of the feed. This will get you close enough to the bulk amount of nitrogen input per day. We know there are other nutrients in the fish feed and we will cover them in a later series. This one is primarily focused on the protein/nitrogen as a bulk input. The Results Biomass The biomass is the maximum standing stock weight of the fish. This is not the production per year but how much weight of fish will be in the fish system when it has reached a steady state of growth. While this calculator does not cover the growth or startup of a system/business, it calculates for the end harvest result (which is where you make money). The biomass is regardless of all in an all out. The formula, discussed in the recent webinar, is useful for estimating with a confident accuracy the standing stock or biomass from your expected yearly production. Daily Feed The feed input per day is a calculated number based on the inputs in the Biomass and Feed Rate fields. As you increase either or both of the biomass and feed rates the overall feed input result will also increase with it. Example Biomass * Feed Rate = Daily Feed. This result is the overall average kg of feed input per day. This number will fluctuate up and down over the growing cycles. Nitrogen The Nitrogen in the feed is a calculated result. We arrive at this result by using the common protein to nitrogen conversion factor. Nitrogen = Protein / 6.25 or Protein * 16%. This is a very loose number which can be as low as 5.20 but publications are unanimous in the conversion factor of 6.25 works well in most cases. The Nitrogen amount is the key to the rest of the growth in the system. It provides for the fish needs along with bacteria and the end result of the plants. There is no value in converting between oxidized states of nitrogen for calculation because regardless of its form (NH4, NO2, NO3 etc) as long as it does not escape the system through gas or water removal/exchange, then it will still be in the system “somewhere”. So we balance out the nitrogen in, carry it through the processes within the system, then see what is left at the end. The nitrogen does not magically appear unless you put it there, however it can be stored in bacteria cell mass and porous media however it will not reside long in media. We have accounted for cell mass storage however we have not accounted for any storage in media. If you have a media storing the nitrogen through ion exchange, similar to phosphorous, the nitrogen in the water will find its equilibrium (balance) with the nitrogen in the media and in time that nitrogen will be released. So you have not lost it but it may be released as gas, then you have. Source Water Nitrogen You must also consider your source water may have some amount of nitrogen in it in any form. For example you may have ammonia, nitrite or Nitrate in the water you put in. This is great because it cost you very little to get. 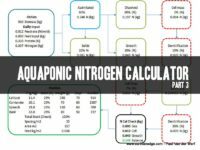 This calculator does not account of any other Nitrogen inputs outside of the fish feed. As we follow the Nitrogen’s path through the system, we can see where it is consumed or lost. In the next part we take a closer look at the assumed path of nitrogen. At the end of it all, the nitrogen being put in must equal the nitrogen taken out of the system less any losses. It does not magically appear….